**The WC Standings from 3rd place down are kind of interesting. Nashville is in 8th despite being only 2 games over .500, on pace for ~88 points. It's a good bet that this is just one of those things that will work itself out over the rest of the season -- anyone really wanna bet that you get in with 88 points? -- but to date, it's essentially a structural thing based on the relative quality of the WC teams. Two teams have been extremely dominant (record-wise), so it's natural that the bubble moves down a bit because the group as a whole is losing all their games to those two teams. 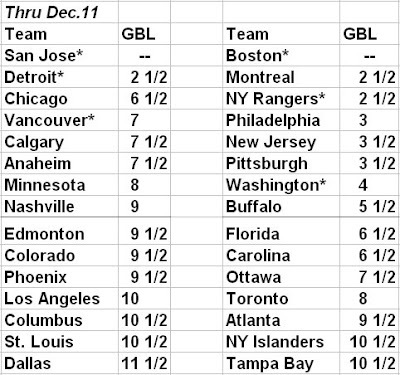 Conversely, there are no really awful teams (yet) against whom the group as a whole is winning all their games. If you look at Dallas' playoff prospects based on "they probably need 94 points", they're nearly screwed. They'd need 70 points over their final 55 games; they'll have to be as good or better than 3rd-place Chicago has been to date. But if you look at it based on where Nashville is right now -- only 2-1/2 games ahead -- it's achievable, if Turco perks up and they get some guys healthy. Passing 7 teams would be an issue if there were 25 games left, but there are 55. Play well, and that'll take care of itself. San Jose, though: do you realize that they've basically clinched the Pacific title already? They've played 28 games and they're 20 games over .500! If they go 2 games under .500 the rest of the season -- a pace presently being met or exceeded by ~3/4 of the league -- they'll finish with 100 points. Say they only slip a bit, and their record the rest of the way is like Anaheim's so far, they'll go another 9 games over .500 and finish with 111 points. **Anyone heard any good stories lately about how the Wild don't need Marian Gaborik to win? Yeah, me neither. In the 20 games since starting 6-0-1, they're 9-11-0 despite having 11 home games, getting decent goaltending, and scoring 21 PP goals to their opponents' 11. The dude's groin is an issue, no question, but he is an elite 5v5 performer and has been for years. Having him in the lineup will make the Wild (or whoever ends up with him) a lot better. **Half-hearted apologies go out to the Blue Jackets for the jinx I threw out on them last week. The good news for them is, the world remains round and they're in easy striking distance of a nice slot in the standings. **If I don't make it back for a game day post later, Go Flames. And watch out for that Radek Dvorak.